Happy Saint Patrick’s Day! The only day of the year when it is acceptable to wear green head-to-toe, eat corned beef and cabbage for every meal of the day and to, of course, make a fool of yourself attempting to Irish dance. In honor of the wonderful holiday today, I wanted to create a green food that was as tasty as it was green. A few things came to mind; green eggs and ham, green mashed potatoes, even a nod to avocado toast, but none of these were new or different. I needed something exciting and unique. 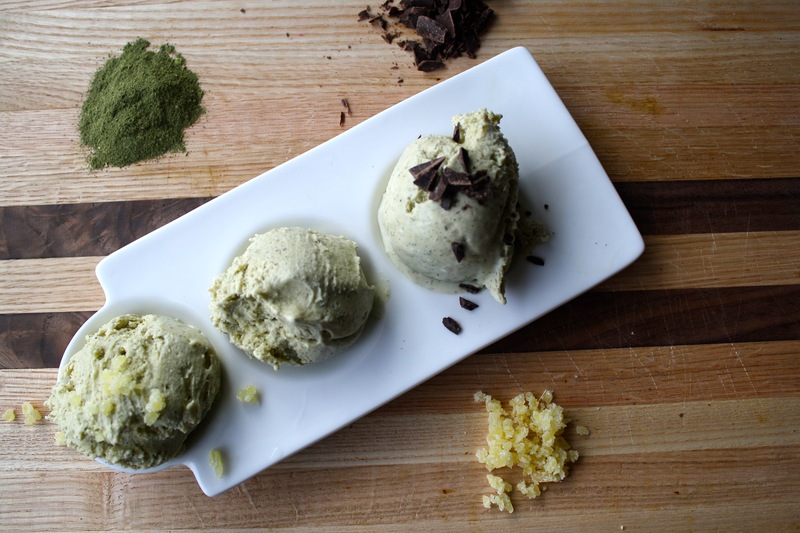 After numerous ideas came and went, Matcha green tea powder emerged to be the perfect secret ingredient. Matcha powder, grown and produced in Japan, has many applications in the kitchen. 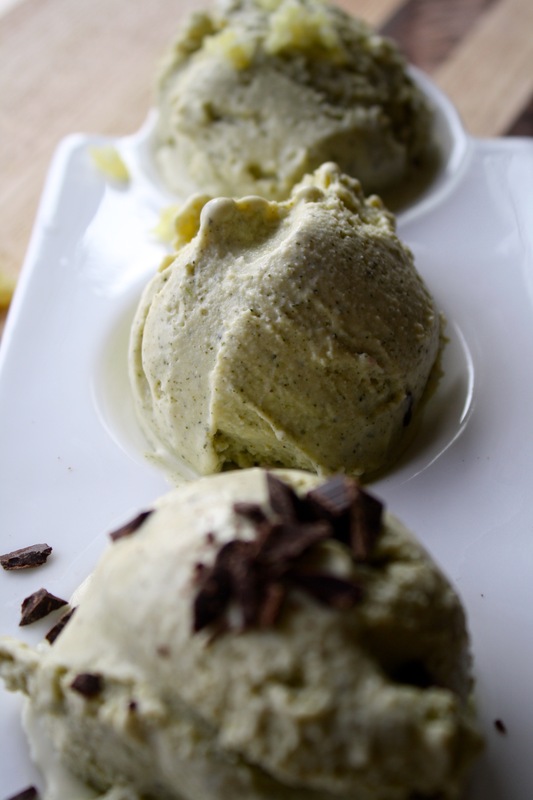 Uses range from tea (of course) to cakes, cookies, homemade pasta, sauces and dressings. The powder is known for its astringent rich, grassy flavor, and tends to have a much fuller body than regular green tea. Matcha green tea contains the same health benefits as green tea, but at a higher concentration. It is full of nutrients, antioxidants, fiber and chlorophyll. One glass of green tea made from matcha powder has been said to be the equivalent of 10 glasses of regular green tea. For this recipe, I bought Matcha green tea packets and ground them into a powder in my spice grinder. I choose to do it this way purely for a different look. I love being able to see the flecks of tea throughout the ice cream. 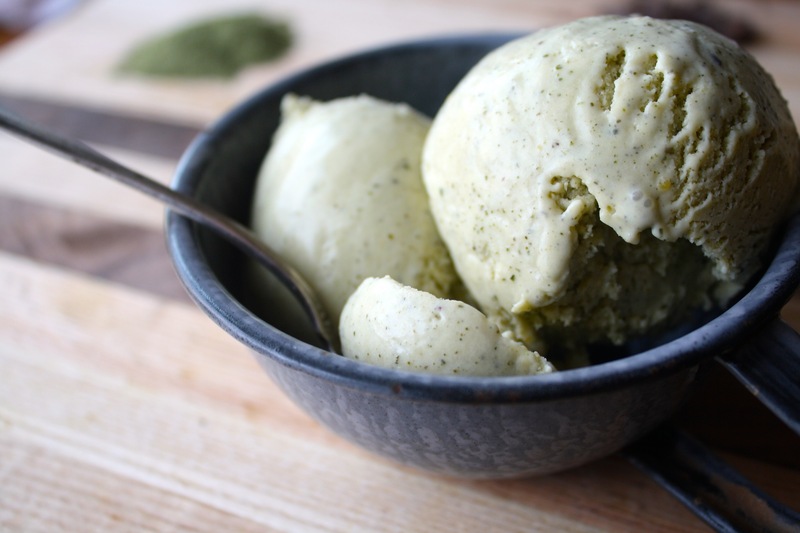 If you want an ice cream that’s purely green, use matcha powder. 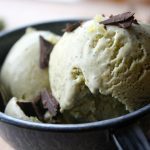 This ice cream whipped up into a beautiful, subtle green color with a wonderful balance between sweet cream and delicate green tea. 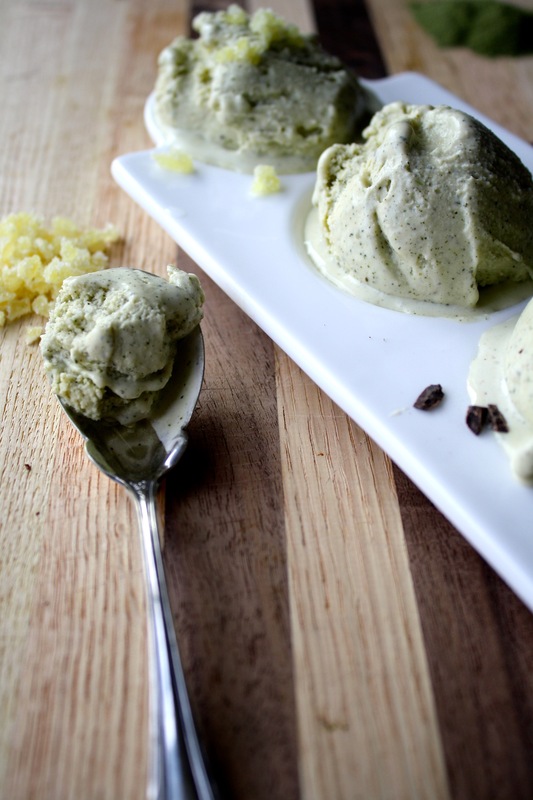 Refreshing, decadent and very dimensional, this ice cream with surprise you!
. If I have the room, I like to keep the freezer bowl in my freezer for the duration of the summer. That way, when I get a hankering for something cool and sweet I’ve got everything ready! In a medium saucepan, off heat, whisk egg yolks, sugar, and salt together until blended. Slowly whisk in milk until completely incorporated. Turn heat to medium and cook custard mixture, stirring constantly with a wooden spoon. Cook until custard slightly thickens and evenly coats back of spoon (draw a line down the back of the spoon with your finger, if the line stays visible, it’s ready), 10 to 12 minutes. 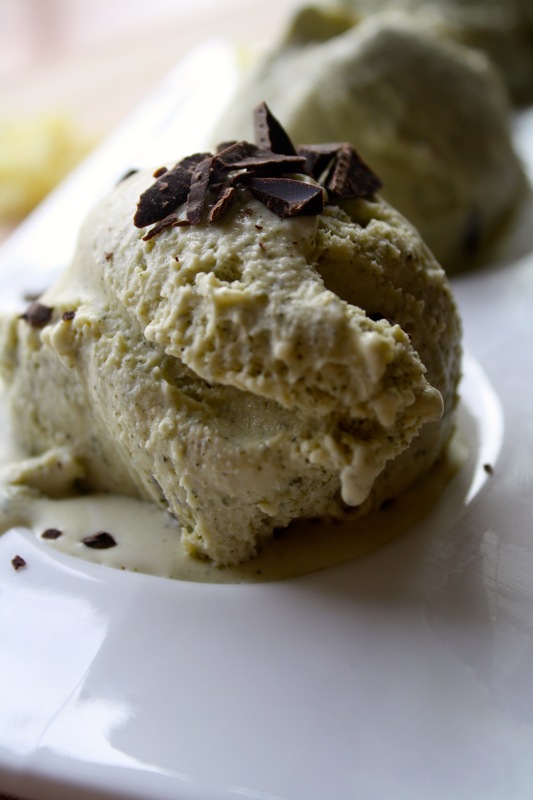 Remove custard from heat and stir in vanilla extract and matcha powder. Cover custard and refrigerate for at least 45 minutes, or up to 1 day. Pour custard through a fine-mesh strainer into a large bowl; discard whatever was caught in the strainer. Whisk in chilled cream. Pour mixture into an ice cream maker and churn according to manufacturer’s instructions. 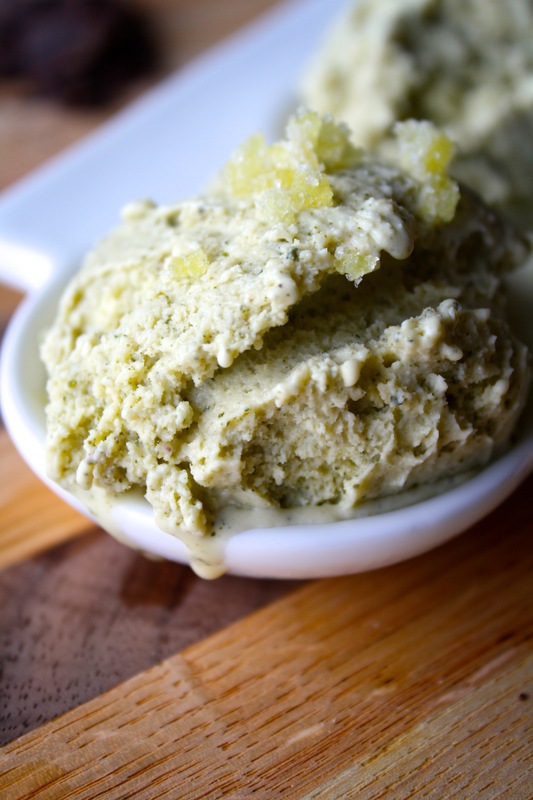 (I use a Cuisinart Ice Cream and Sorbet maker and I churn mine for 15 to 20 minutes.) Stir in optional ingredients (ginger and/or chocolate) before freezing, or leave them out and garnish with these ingredients when serving. 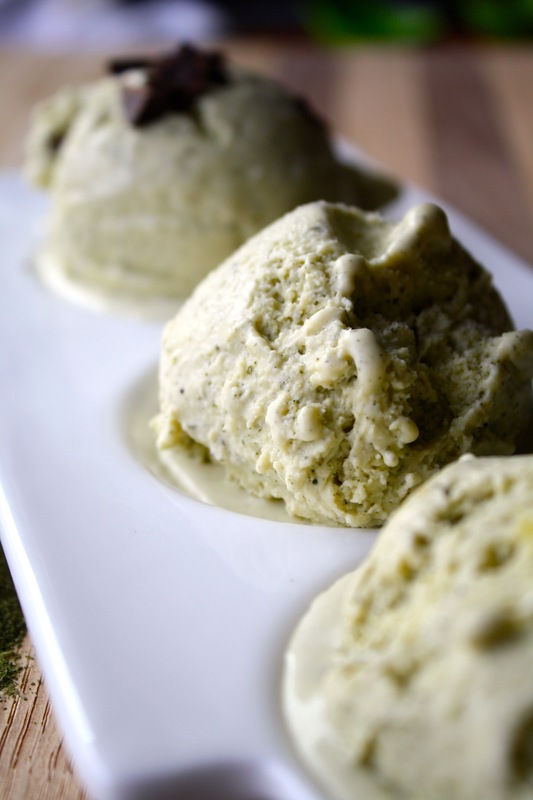 Transfer ice cream to a plastic container fitted with a lid; freeze until firm, 3–4 hours. This ice cream (or any homemade ice cream) will keep in the freezer for 3 months but is best enjoyed within 2 months. Anything longer and ice crystals will start to form.